Chronic myelogenous leukemia (CML) develops from an abnormal pluripotent stem cell and is consistently associated with the Ph chromosome and/or the BCR-ABL1 fusion gene. Transformation into the progressive disease is usually the result of additional clonal cytogenetic abnormalities in the tumor cells. Blast phase of CML (BP-CML) can present as an extramedullary blast proliferation before bone marrow involvement. The presence of T-cell blast proliferation along with myeloid lineage at an extramedullary site is quite rare and needs to be highlighted for identification of this distinct entity. A 33-year-old male patient presented with bilateral axillary, cervical, and inguinal lymphadenopathy along with the intermittent fever of 2 months. Complete blood examination showed hemoglobin 9.3% gm, total leukocyte count(TLC) 1,09,000/cumm with blast 7%, promyelocyte 9%, myelocyte and metamyelocyte 40%, neutrophils 25%, eosinophils 6%, monocytes 4%, basophils 7%, and lymphocytes 2%. Screening abdominal ultrasound revealed massive hepatosplenomegaly. Quantitative analysis of BCR-ABL fusion transcript by the real-time polymerase chain reaction on peripheral blood was 63.53%. Peripheral blood fluorescent in situ hybridization (FISH) analysis of 200 interphase cells showed BCR-ABL fusion positivity in 98% cells. Microscopic examination of the right supraclavicular lymph node excisional biopsy sample revealed complete effacement of nodal architecture by intermediate-sized atypical lymphoid cells present in sheets. The cells had high nuclear to cytoplasmic ratio, irregular nuclear membrane, dispersed chromatin, and scanty cytoplasm [Figure 1]. Considering this histomorphology finding, an initial immunohistochemistry panel with CD3, CD20, Ki-67, and TdT was performed [Figure 2]a,[Figure 2]b,[Figure 2]c. With strong diffuse positivity for CD3, TdT, and a high Ki-67 index, the second panel of T-cell markers (CD2, CD4, CD5, CD7, and CD8) was applied where all the markers showed strong positive results except for a loss of CD4. TdT was positive in 95% of the cell population. These cells were also negative for CD30. CD20 highlighted B-cells in few retained follicles. Immunostain for myeloperoxidase showed positive results in few blasts [Figure 2]d. A diagnosis of bilineal extramedullary blast crisis of myeloid and T-cell lineage in CML was established. 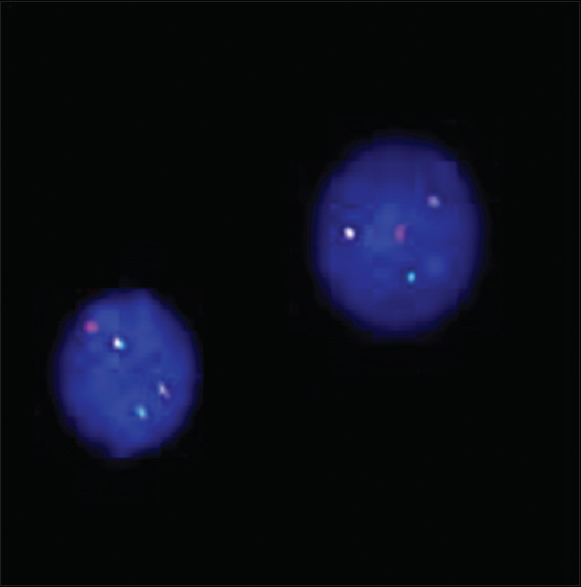 Cytogenetic study with FISH on the nodal sample showed BCR-ABL fusion in both myeloid and T-cell lineage blasts [Figure 3]. The patient was treated with standard ALL chemotherapy regimen along with Imatinib showing complete hematological response and regression of lymph nodes within 4 months. After 18 months follow-up, the patient presented with increased TLC (139,400 cells/cumm), having 88% blasts, and then subsequently lost to follow-up. CML includes three phases chronic phase, accelerated phase, and BP. The BP-CML indicates disease progression resembling acute leukemia clinically and morphologically. The presence of blasts >20% in peripheral blood or extramedullary blast proliferation in tissues recognizes BP. Skin, lymph nodes, spleen, and central nervous system are the common sites for extramedullary blast proliferation accounting 6%–10% of cases. These can either precede or occur simultaneously with or subsequent to the recognition of BP in the bone marrow. Blast transformation is a result of additional cytogenetic clonal evolution such as + 8, 1(17q), +19, and acquisition of an extra Ph chromosome. The genes commonly found to be mutated or abnormally expressed in transformed stages include TP53, RB, MYC, EVI1, and p16INK4a. The extramedullary blast proliferation in about 70% of cases is of myeloid lineage and 30% of cases of lymphoid lineage, most commonly B-cell phenotype. A T-cell phenotype blast proliferation is rare with <50 cases reported in literature till date,,, so are those demonstrating a bilineal proliferation. Only few cases have been reported with bilineal extramedullary blast proliferation in CML.,,,, In bilineal blast proliferation, both myeloid and lymphoid related antigens can be found on the same cell or on different cells, suggesting genetic alterations at the pluripotent stem cell level result in the development of blasts of both the lineages. Vega et al. reported 6 cases of bilineal lymphomas as the 8p11 myeloproliferative syndrome with balanced translocations involving chromosome 8p11, most commonly t(8;13) (p11;q12). These cases had generalized lymphadenopathy and were characterized by the coexistence of a chronic myeloproliferative disorder, eosinophilia, and precursor LBL, usually of T-cell immunophenotype, later developing into acute myeloid leukemia (AML). The t(8;13) (p11;q12) resultant fusion protein constitutively activates FGFR1 tyrosine kinase, and results in multiple signal transduction pathways, stimulating clonal proliferation, analogous to the BCR/ABL1 fusion protein in CML. However, the present case showed the presence of BCR/ABL1 fusion protein in blasts of both the lineages and did respond to Imatinib as is not seen in 8p11 myeloproliferative syndrome. Variant translocations involving 9q, 22q, and at least one additional genomic locus reported in few cases. Bourlon et al. reported a karyotype of t(1;9;22) in a case of CML presenting as bilineal extramedullary blast proliferation in the vertebra. The various differential diagnosis of extramedullary blast proliferation includes de novo AML, lymphoblastic lymphoma and blast crisis in CML. The distinction between these entities is difficult with histomorphology alone without proper clinical information and immunohistochemistry. Few cases are reported highlighting these pitfalls. An erroneous diagnosis of T-lymphoblastic lymphoma would have been made if a history of CML was not available. Lymphadenopathy in cases of CML is uncommon, warranting a nodal biopsy to exclude blast crisis. In addition, present case did not show a spectrum of myeloid differentiation in the nodal biopsy with promyelocytes, metamyelocytes and band forms, usually seen in combination with the proliferating myeloid blasts as in myeloid sarcoma, thus posing a diagnostic challenge. The help of immunohistochemistry and a suspicion of the existence of bilineal or biphenotypic blast proliferation helped us to identify the second population of blasts which expressed myeloid markers. However, the primary diagnosis in these cases should be BP in a case of CML since they are different from de novo mixed phenotype acute leukemia. The treatment of these patients includes a tyrosine-kinase inhibitor along with chemotherapy and finally stem cell transplant. However, for the biphenotypic blast crisis, the choice of induction regimen for targeting myeloid or lymphoid blast is still not proven. The present case with T-cell blasts of >90% and few myeloid blasts, treated with standard ALL chemotherapy regimen along with Imatinib showing hematological response and regression of lymph nodes. CML rarely presents with lymphadenopathy, and when observed should hint towards extramedullary blast crisis. An awareness of this distinct pathological entity can prevent misdiagnosis and achieve prompt initiation of treatment. Bourlon C, Vargas-Serafín C, Bourlon MT, de la Peña-Lopez R. Biphenotypic extramedullary blast crisis of chronic myeloid leukemia with variant Philadelphia chromosome translocation. Oncology (Williston Park) 2015;29:575-7. Krishnan S, Sabai K, Chuah C, Tan SY. Bilineal T lymphoblastic and myeloid blast transformation in chronic myeloid leukemia with TP53 mutation-an uncommon presentation in adults. Curr Oncol 2014;21:e147-50. Raanani P, Trakhtenbrot L, Rechavi G, Rosenthal E, Avigdor A, Brok-Simoni F, et al. Philadelphia-chromosome-positive T-lymphoblastic leukemia: Acute leukemia or chronic myelogenous leukemia blastic crisis. Acta Haematol 2005;113:181-9. Kim AS, Goldstein SC, Luger S, Van Deerlin VM, Bagg A. Sudden extramedullary T-lymphoblastic blast crisis in chronic myelogenous leukemia: A nonrandom event associated with imatinib? Am J Clin Pathol 2008;129:639-48. Ye CC, Echeverri C, Anderson JE, Smith JL, Glassman A, Gulley ML, et al. T-cell blast crisis of chronic myelogenous leukemia manifesting as a large mediastinal tumor. Hum Pathol 2002;33:770-3. Yashima-Abo A, Satoh T, Abo T, Aoki Y, Kowata S, Ito S, et al. 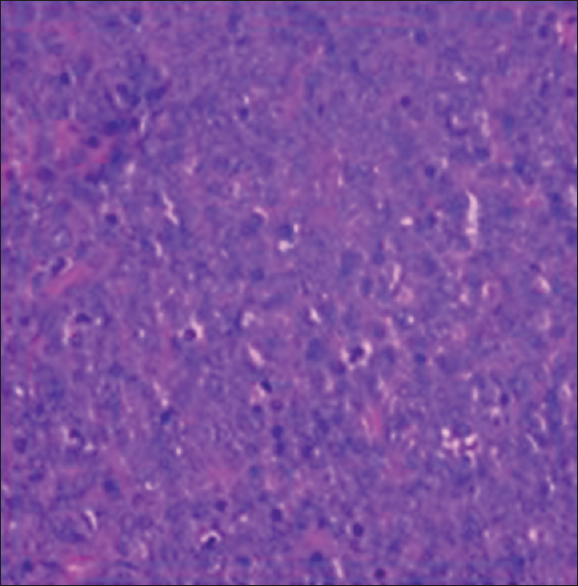 Distinguishing between proliferating nodal lymphoid blasts in chronic myelogenous leukemia and non-Hodgkin lymphoma: Report of three cases and detection of a bcr/abl fusion signal by single-cell analysis. Pathol Int 2005;55:273-9. Chen X, Rutledge JC, Wu D, Fang M, Opheim KE, Xu M. Chronic myelogenous leukemia presenting in blast phase with nodal, bilineal myeloid sarcoma and T-lymphoblastic lymphoma in a child. Pediatr Dev Pathol 2013;16:91-6. Akashi K, Mizuno S, Harada M, Kimura N, Kinjyo M, Shibuya T, et al. Tlymphoid/myeloid bilineal crisis in chronic myelogenous leukemia. Exp Hematol 1993;21:743-8. Vega F, Medeiros LJ, Davuluri R, Cromwell CC, Alkan S, Abruzzo LV. t(8;13)-positive bilineal lymphomas: Report of 6 cases. Am J Surg Pathol 2008;32:14-20.